Jonathan took careful aim and leveled a firm blow with his hammer at the circumference of the hairy, brown coconut in his hand. The crack resounded in our kitchen and made Cindy and I giggle with wonder. Jon gave the coconut a quarter turn and whacked it again. This time, we could hear the beginnings of accomplishment in the echo. With a twinkle in his eye, Jon hoisted the coconut up to our eye level so that we could see the crack that was crawling around the equator. He set his jaw and raised the hammer one last time. As hammer connected with shell, thin streams of clear coconut milk began to drain into the pan we'd set on the counter. 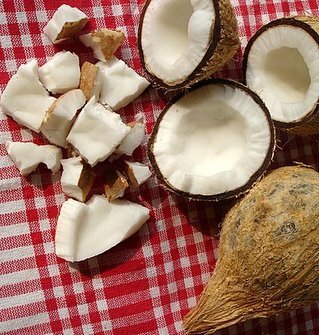 Finally, the coconut split... revealing two pristine, white, concave faces. Cindy and I had decided that a Saturday evening would the perfect time to bake a cake, and fortunately, two dear friends had gifted Jon and me with a cake-specific cookbook at Christmastime to aid in this endeavor. But it was Jon, eager to indulge his inner Survivalist, who chose the Coconut Cake. Never mind that it was the cake on the cover of the book, enticing in its pure, fluffy white glory. Never mind that we'd not baked a thing (besides biscuits) from scratch in our lives. The chance to split open a coconut was too exciting for Jon to pass up. So, the four of us gathered in my recently-more-frequently-cooked-in kitchen to conquer the Great White Cake. The task before us was daunting. Cindy poured the wine. Step Two was to pry the "meat" of the coconut from its shell. This was harder than you'd think as the tough brown skin of the nut keeps its precious insides locked in a death grip. Cindy and I chiseled with butter knives and cranked our respective coconut halves across the counter, laughing at our difficulty all the while. One thing I will say about field dressing a coconut... it's excellent therapy if you've got pent up stress about something else in your life. For me, it's Mom's brain. She underwent the Gamma Knife procedure last Thursday, a scenario which included having her face strapped down to a table while a computerized arm whirled around her head and shot lasers into her brain for forty-five minutes. It sounds like science fiction, doesn't it? But this one bout of radiation might just mean the reduction (and hopefully the disappearance) of the tumor which remains on her Pituitary Gland over the next three or so years. It also might not. And Mom's brain is far from out of the woods. Wrestling with my half of the coconut, I found myself battling with Mom's tumor and the fear that her fate might well be my own. I stuck the knife between the white flesh and the brown skin and hollered, "Get out! Get out! Damn you!" Silently, of course, so as not to startle my best friend or my husband, especially knowing that the latter would calmly reach out, take the sharp object from my hand and say, "No more knife for you." In the meantime, Cindy continued stabbing and prying at her coconut. She's dealing with a break-up. It's still new, this separation from the young man who has been her other half, her play mate, and her confidante for the last year and a half. Their division has been difficult (an understatement) for everyone involved... mostly because the fact of them together was equal parts sweet, natural, and aesthetically pleasing. Beyond that, like any woman, like any flower, Cindy feels best when she's being cared for. Taking a break to wipe sweat from my brow, I looked at my best friend. Her face was flushed pink with exertion as she struggled with her coconut foe, stabbing, twisting, kneading it into submission. Just a girl and her heartsickness grappling in my kitchen. But all the time we were laughing. Chortling as the round sides of the coconut halves scooted across the tiles and made us stretch to retrieve them. Chuckling at the absurdity that it takes two healthy, strong twenty-five year olds to slay a single seed. Over the next four hours, the three of us boiled the sugar water into syrup, whipped the eggs into a meringue, and baked the two yellow layers of the cake until they were golden brown. We slathered the cake with the airy white icing, licking the sticky parts of our fingers and rejoicing at our impending success. The finishing touch, of course, was the application of three cups of freshly shredded coconut to the entire surface area of the dreamy cake. All three of us took fistfuls of the stuff and sprinkled it over the dome, patted clumps to the sides and filling any empty space. It struck me then, at the climax of our evening, that true love is in the details of life, the space in between the big stuff. Not necessarily the cake, though that's good and even necessary, but the icing and the wispy coconut topping. Much has happened in our lives already, but much more remains to be seen. Mom will continue striving for health against the odds, and I will watch and try to assist as best I can; while this part is hard, I accept it, finding it tougher to deal with rawness of the affect of this situation on my own mortality. Cindy, funny, smart and beautiful, will grieve and go on. And there isn't a doubt in my mind that she'll get through these weeks and months and then discover the life she's meant to have. In the meantime, we have each other, we have our families, we have our careers, our hobbies, our youth. And when the stacking of those things upon one another doesn't quite get us within reach of our own sanity, we now know that we have coconut cake. Photos of our coconutty adventure can be seen here .